Before we came to an age where everything was made for our phones, there was a time of devices. When we say devices we mean electronic platforms which were brought out for a single purpose. You had a device for checking the weather and soil make. Also, you had devices for listening to music or watching movies. Every device was different. Therefore, every device was built differently. With this pretext in mind, you can go ahead and pick up readers to specify their needs. Thus, you could get multiple options for reading eBooks. Ebooks by themselves are a recent phenomenon which has changed everything we knew about books. By change, we mean only for the better. You can do so much more when it comes to the digital books or eBooks that it’s a blessing. For avid readers and book critics, eBooks are surely a great option to get as many books as possible in their libraries and bookshelves. Of course, with eBooks, came specific devices which could read them. Of course, not just read them but also give out options for the ease of reading. That is where devices like Nook, Kindle, and Sony Reader came about. Let us now see where the journey of Sony reader starts and its features as well. We can trace back the start of eBook reader to perhaps the turn of the decade in 2000’s. Companies started lapping the chances of becoming the next big firm in books and publishing industry. Also, they wanted to expand their markets beyond domestic areas. And building devices which could read multiple languages and scripts were the need of the moment. Every firm worth its salt jumped at the opportunity at creating something new and modern. The internet giants weren’t far behind. Amazon was already making good ground for bringing out Kindle. Kindle was to become in time to come one of the best eReaders in the world. That is of course till we get to the point where Sony came out with its range of readers. Sony readers suddenly took over the market and with its innovative features changed everything we knew about eBooks till then. 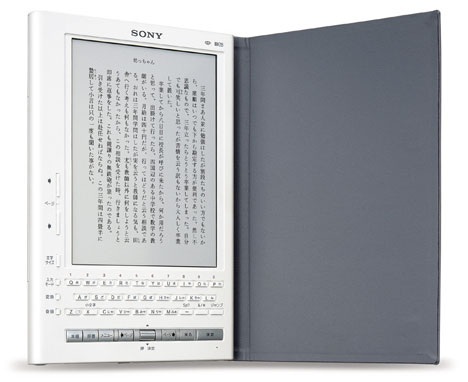 Sony came out with an eBook reader in the year 2004. The Sony Librie was the market electronics giant’s first product to come out. The reader, of course, was known to many as EBR-100EP and was originally brought out in April 2004. Therefore, It was the very first commercial e-ink device. However, the said eBook reader was sold only in Japan. It was perhaps only after ten months or so that the device got into the international market. Thus, many devices were sold in the US through online retailers and with a third-party English OS upgrade. You got a resolution of 800×600 in this device. Though it isn’t incredible when you look at it now, but in those days it wAS pretty amazing. Also, many modern e-readers still adhere to this old standard. One more thing which really stood was that the capacity. Thus, Reader was surprised that the device could hold over 10 books with the 10MB of storage. Sony Librie came with the music facility as well. Therefore, you could plug in your earphones and easily listen to music using the device. Of course, later you could also listen to AudioBooks in the device, making it all the more effective and useful. The Librie was interesting historically because Sony developed their own proprietary eBook format, LRF. This model basically only read books that were purchased from the Sony Japanese bookstores. The Sony PRS-500 was known as “A Reader” in their promotional and marketing campaign. This was the first device that Sony marketed outside Japan and was released in September 2006. You could get your hands on this device a year before Amazon got out it’s offering to the world. Thus, the device which was called Kindle came out to the market. Sony streamlined this e-reader and discarded the physical keyboard that was on their first device ever made. Instead, they went with a unique controller system that was in essence two joysticks. Thus, One was for page turns and the other for accessing the menu, settings or dictionary. This was perhaps a better way of reading an eBook which was not being offered by many other tools or devices out there. Also, with this reader, a better thing you could get was storage capacity. As we saw above, the first Sony reader could only store 10MB of data. However, with this model, Sony brought out and this model was upgraded to hold 64MB, which drastically increased the amount of books that could be loaded on it. Also, the customers were free to delete their books as and when they wanted. This is important because, in previous versions, you had to remove a couple of books before loading any. Thus, the Sony reader became easier to operate. In this context, within the space of the device, you could store well over 80 books. This reader had the same e-ink screen as the Libri but had a faster processor. On November 16, 2009, Sony announced that a firmware update is available to support the ePub and Adobe DRM format and add the ability to reflow PDF documents”. Owners must send the reader into the Sony Service Centers for the updated firmware. You can obviously tell how infant the e-reader industry was during this era when you had to mail away your e-reader for over a month for them to load the new firmware for you. 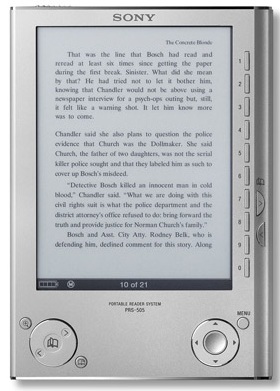 The Sony PRS-505 was originally released in October 2007, the same year Amazon unveiled their first generation Kindle. With this model, Sony brought in many more new features which were missing in the earlier versions. which used a new e-Ink Vizplex display screen, which provided faster page turns than the prior models. Although the overall performance was enhanced, Sony still stood with the 800×600 resolution. This also marked the first time that you could charge a Sony reader via the USB cable. Sony increased the internal storage yet again on this model, which saw a dramatic leap to 256MB and over 500 books available to be stored. Also, adding books to “Collections” (a feature to organize and group book titles) is now possible on the SD card, unlike the PRS-500 model. In July 24, 2008, Sony for the first time brought out a firmware update to this model. With the update in place, you could now support the widely popular eBook type, ePub format. Not only this, you could view and read Adobe Digital Editions 1.5 and Adobe DRM protected PDF files. Also, in addition to this, you also got automatic reflow of PDF files. The files formatted for larger pages enlarges the text to improve readability, and support for high capacity SDHC memory card. Thus, Sony made it easier to read eBooks than ever before. Also, the updates released where for the first time went for Over the Air updates. With this version, you can easily follow the instruction that came along with the reader to update the reader. 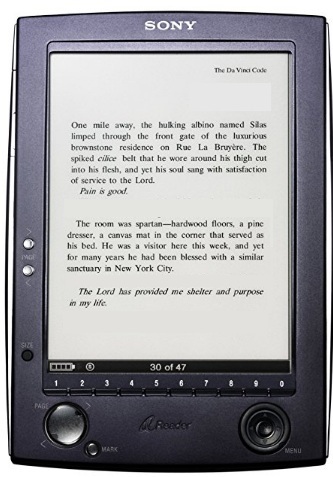 The Sony PRS-700 was a benchmark e-reader and brought out many great features. Of course, you also get several fonts which made the reading all the more engaging. 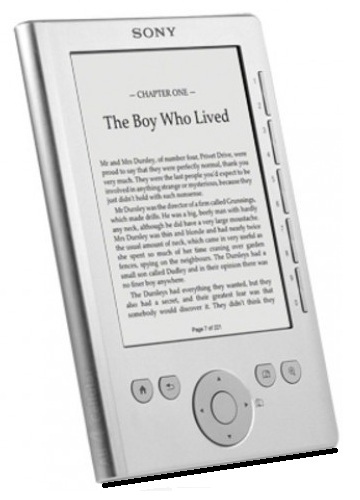 It was the first touchscreen e-reader and the first model to feature an illuminated screen to let you read in the dark. Thus, Sony took the existing technology and made it something wonderful for all its eBook readers and people who were just starting to get a taste of eBooks. Sony heavily invested in touchscreen technology with their e-readers and this was the first of many to fully adopt it. The company played a great role in bringing technology for even Smartphones with its touchscreen ideas. Moving in this direction eliminated the D-Pad and most keys, minimizing the buttons and making it easier to hold. This reader from Sony, was also the first e-reader among many, that allowed you to make highlights, annotations on the fly. Therefore, you could take advantage of the new virtual keyboard. The LED lights on this unit was a front face to the front-lit technology we see on the modern 2014 readers. 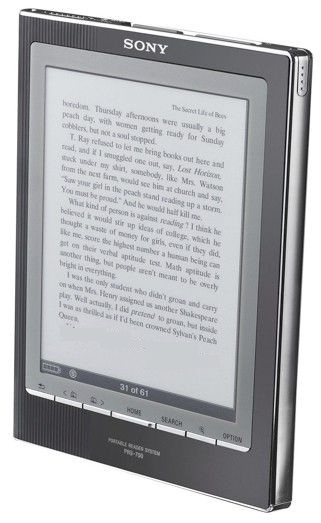 This was brought up by multiple eBook readers in future, such as the Nook Glowlight, Kobo Aura and Kindle Paperwhite 2. The process of change started with Sony making in-roads and taking the risk of developing technology never seen before on an e-reader. However, the reaction from the market was not something Sony company expected. When after the product launch, tech critics asked for reviews, most users said that the reader became more complicated than ever. The overall experience was really troubling. Thus, the executives behind the idea were shaken so much that they said they would never make a LED reader ever again. Hence, you could see that the leadership that Sony had over the market slowly came down. Users were looking for other options as well, stepping beyond the readers from the company. Sony looked at bringing to the fore, the best eReader to the market. Its aim was to bring a device which could read not only ePub but also file formats like PDF, CBR or Mobi. However, Mobi was taken by Amazon as its native format and was not open to being used by anyone other than Kindle or Mobipocket systems. Therefore, you could read ePub files and PDF within the reader. The Sony PRS-600 was known as the Touch Edition and was released the very same day as the five inch Pocket Edition in August 2009. Perhaps, this was a clever ploy on the company’s part to balance its risk. You could see that either of these devices had different features. This reader continued the trend of having a speaker and 3.55 headphone jack and relied on the touchscreen as a way to take notes and highlights. 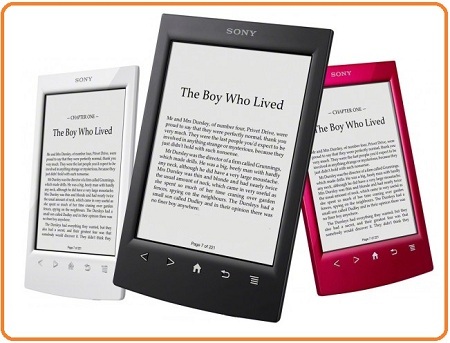 The Touch Edition was the first time Sony marketed their readers in three different colors, black, white and red. This model also increased the storage from 256MB on the prior model to over 512MB. It had the same resolution as the older models, so did not break any new ground on the ePaper front. Up until the launch of the Touch Edition all Sony, e-Readers were unable to read PDF or EPUB files out of the box. You had to either send them to Sony via mail for them to manually patch or do it yourself. Thus, This was the year that Sony firmly switched over from their own LRF format to EPUB and native PDF support. Therefore, the company truly came on its promise to create new devices which brought technology forward. Thus, you could see a clear crossing of paths between Amazon and Sony to bring their own systems in place. The move to firmly get in EPUB and PDF allowed a new generation of users the freedom of choice. You were no longer bound to buy ePub ebooks only at the Sony store. You could go ahead and buy books at any other hosting sites for free. There came about many free eBook websites for this very purpose. Instead, they could deal with other retailers and use Adobe Digital Editions to sync up the purchases. This was the first e-reader that Sony stepped their marketing efforts on. They made some stock images for bloggers to use in their writeups and started blitz campaigns in the Sony Style stores and also expanded their retail distribution into countries like Canada. The Sony Pocket Edition was released in August 2009, the same day as the PRS-600. Sony went back to their roots by offering an entry level reader for a solid $199, which made it one of the cheapest models at this point in time. One of the ways Sony saved many was abandoning the costly touchscreen technology and instead went with physical page turn keys, D-Pad, and manual page turn buttons. Although this was a backstep in making more screen based devices, Sony decided that it was best to go with basic facilities. After all, the previous versions had made Sony look a bit far fetching than usual. As with the previous versions, It also had no MP3 audio or expandable memory. It has a similar interface to the PRS-500 and PRS-505. Of course, the intent behind this was to provide people a more involving experience for reading. Yes, there were still many another reader like Kobo, Kindle which was slowly using the idea of multimedia devices. They were looking at Kindle to provide not only for just reading but also much more, in terms of videos and audio. You could use these devices to do more, and even watch videos too. As always, Sony got into the market with a storm. However, it didn’t take much time before other publishing companies picked it up and got to bettering it. When the Sony Daily PRS-900 was first unveiled in December 2009 it bucked the trend of the standard six-inch device and incorporated a 7-inch screen. Sony also borrowed a page out of Amazon’s playbook and offered free 3G internet access to the US version of the Sony bookstore. Sony increased the memory yet again to a whopping 2GB, which allowed over 1700 books to loaded on it. It also boosted up the resolution, making it the best on the market at this time. It had 1024×600, which was ideal for reading texts in landscape or portrait mode. The Daily Edition was the first time there were no hardware buttons at all. It was completely reliant on the touchscreen and Stylus for all of your inputs. 2009 was a big year for Sony with 3 new devices hitting the market months within each other. This model was really expensive and set you back US$399 at the time of release. This was mainly to offset the costs in the internet access, which at the time was a pricey value proposition. 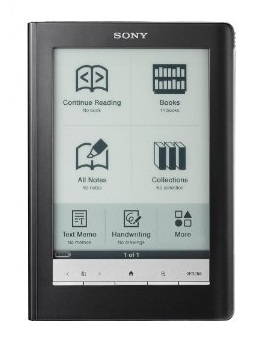 It was considered to be the very best e-reader on the market and was more accessible than Amazon. With a wide range of eBook readers available in the market, it becomes difficult to pick one. Kindle readers have always been a device which has it all. It has a great load of features which are always improving. One major factor which works in its favor is the fact that, Kindle has its own library of eBooks in Kindle store. You can practically get any number of books, read them and even sync them to make available on different devices. Although, you can still opt for other eBook readers like Nook or Kobo with which you get libraries of their own. Having said this, you can always try Sony reader which tries to go beyond the usual eBook readers. If you are someone who wants to lap up new innovative technologies which may or may not come up with other readers. Sony is your deal then. You always get the future tech with these devices. However, if you are a publisher from the other side of the coin, and are looking to make your book compatible with all these devices, you need a publisher. A publishing company which has expertise in preparing books in the best form possible and making them available for all and any eBook reading devices and applications. We are an internationally reputed eBook conversion services company which will help you take the market by storm. Drop us a mail and let’s make your work the best out there.